Korea has four distinct seasons. Thus you can visit the same place twice, but experience something different. The previous photos of Bukchon Hanok Village were taken during winter. These set of 40 are taken during autumn. Shot during the Hi Seoul Festival. Event tents covering the sculpture's base. 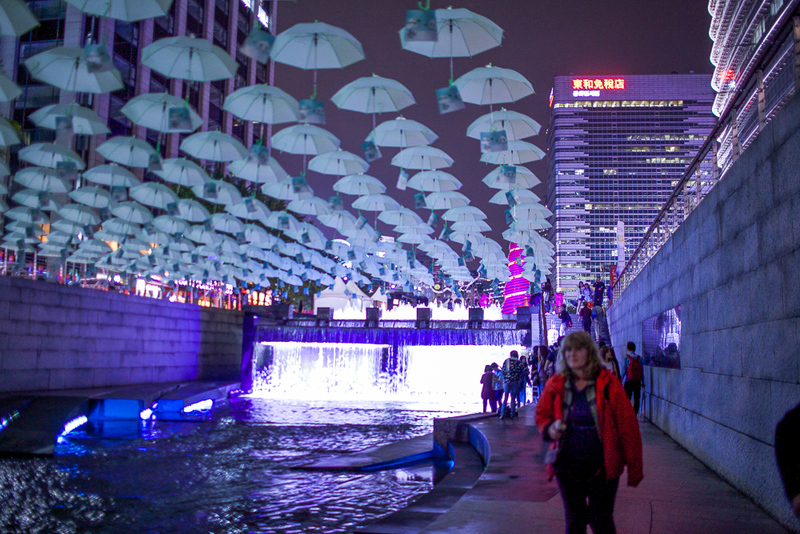 Rain or shine, young or old, single or taken, Cheonggyecheon offers a place for leisure time. The week-long performing arts event hosts creative from all over the world. This shot is taken from "Bivouac!" by Sivouplait. Reproduction of Seoul slums from the 50s and 60s. Located across from the Cheonggyecheon Museum. Old-school dolls on display at the reproduction of Seoul slums. Three pillars left from the Cheonggye Overpass as a reminder of the stream's past. Close look at the Wishing Wall. Ducks grooming themselves during autumn. Note: Please do not literally do laundry at the stream. These abstract washing boards serve as a reminder of the stream's history. If you miss the evening shows scattered throughout Cheonggyecheon, swing by the end closest to Cheonggye Plaza for their lit water features. The diverse bridges on Cheonggyecheon provide a shelter from rain and heat. Learn more from the KWOW episode on Cheonggyecheon!